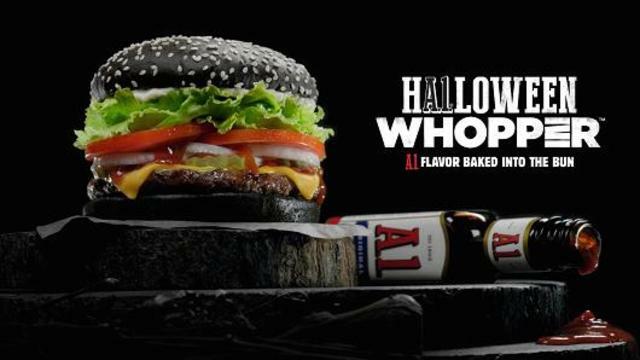 In honour of Halloween, Burger King grilled up the spooky Black Whopper. Brilliant. Horrifying. Like green beer during St. Patrick’s Day or wacky-coloured eggs on Easter, changing the hue of food is nothing unusual. Putting aside what the Black Whopper does to our excrement, I cannot ignore this lame marketing attempt. Colour is not innovation, and rarely does it enhance flavour. Remember in 2013, when Apple released the iPhone 5C? Colour was the newest design update, and they made a big deal out of it—even though the majority of people who have a smartphone have a case for it. Same goes with food—especially fast food. You cannot give something another coat of paint and expect people to be impressed. My first encounter with food of another colour was late in my childhood. I was young and still impressionable, and Heinz EZ Squirt Ketchup caught my attention the way a bug would when it flies into my face. This was in 2000, so I assume you might not remember, but Heinz EZ Squirt Ketchup was the famed condiment company’s attempt to appeal to a younger demographic. Yes, imagine it now: green, purple, orange, and blue ketchup. It sounds too interesting not to try. So, my parents bought me a bottle of the purple kind. I had two hot dogs with it—and that was it. Immediately, at such a young age, I realized what an impact colour had on the overall preconception of food. If it looks wrong, it’ll taste wrong. My brain just couldn’t make purple ketchup good. Don’t believe that colour affects flavour? Try this: grab a bag of Skittles, have a friend with you, and eat each one with your eyes closed and try to distinguish its colour. Red is supposed to taste like cherry, right? Purple is supposed to be grape, right? You’ll be surprised how inaccurate your taste buds are without the help of your eyes. Colour is great for decoration, but it should not be the main selling point for anything, be it cars, appliances, or even food. Ask yourself, when was the last time you ate something just because of the colour? Maybe it was greens, because your parents forced you to—but otherwise, very seldom. When was the last time you were out with friends, and someone asked: “What do you want to eat?” and you said, “Something yellow.” “Fried chicken it is!” Never. That’s not how we make decisions. Food marketers need to be a little more creative, a little more inventive, and a little more tasteful when offering limited-time food. It should not be gimmicky. It should be tasty.